Erica and James eloped earlier in the year, in a small ceremony in Downtown Durham, NC. A totally unique experience,the couple spent the day hanging out a Food Truck Rodeo and local brewery, but the couple still wanted to throw a wedding for their friends and family to celebrate. Their priority was to have a wedding that was fun, low-stress, and that represented their life as a couple. “My husband, James, and I had been discussing getting married and then decided to elope in January 2016 in order to buy a house together. Due to the short notice and the fact that many of our friends and family lived far away, we decided to hold a wedding later in the year for everyone who couldn’t make it to the elopement ceremony.” Erica Began. “We spent about $5000 for our wedding with 65 people. We did this by using an atypical venue that also handled catering in house and by cutting out any details or elements that were not important or meaningful to us.” She explained. The couple chose to hold their celebrations in one of their favorite places to eat and drink on the weekends and the in-house catering was exactly what they were looking for. Although more minimalist in their design preferences, both Erica and James also love bright colors, geometric motifs, and natural elements. 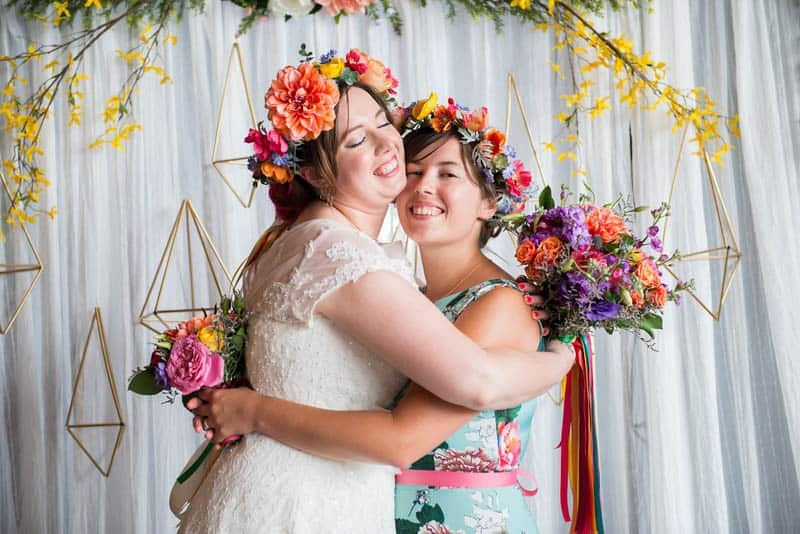 So with help from her sister, Erica set about designing and creating all her own decor and florals, including the crowns, using a mix of faux and fresh flowers. Erica and James initially bonded over their love of craft beer and board games, having met through a board game meet up group. They decided to incorporate featured beers from one of their favorite breweries, Trophy Brewing, who just happen to make two beers called Trophy Wife, an IPA, and Trophy Husband, a saison. Their officiant, Kenna Covington of NC Secular Weddings, created a Beer Unity Ceremony where they made a Black & Tan which they shared. “We had an afternoon wedding followed by an after-party at a brewery and then bar-hopping in the neighborhood. The party continued late into the night with food trucks, good beers, friends, lawn games, dancing, and rum buckets!” Erica added. They continued to party with the couple long into the night at an after-party at the brewery across the street and an after-after party down the street at a local club with a dance floor and outdoor yard games. There were food trucks and delicious beers flowing all night. Lovely article with fab photos. Head decorations are great. We love it! Look how adorable the rabbits on top of the cake are! I’m loving the use of those geometric shapes!